Melksham, Seend, Devizes, Bromham, 41km difficult mountain bike ride – Do your dream! This route is tough. Some really challenging terrain, slippery chalky mud and just mud! The first time we tried this route, Mel ended up in A&E and needed 20 stitches… That said, its not hugely technically challenging, just slow muddy paths, fields, and climbs. Doable with some experience and mountain bike needed. 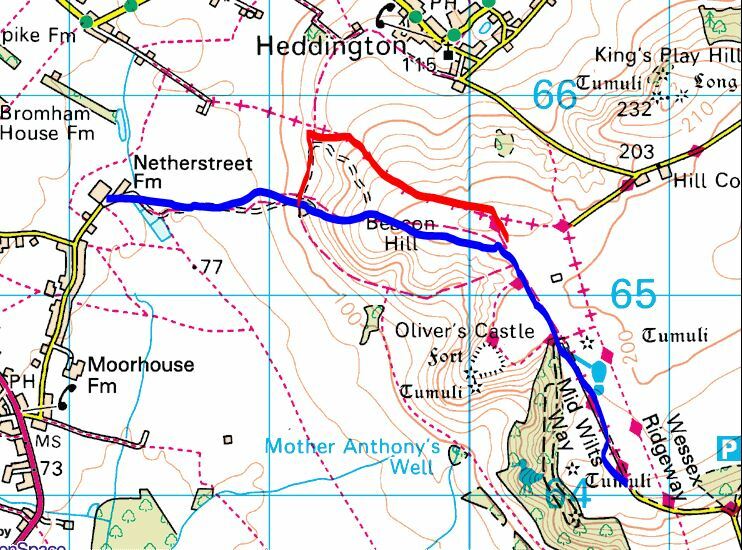 If you look at the OS map, on the roundway, as the route heads west on the bridleway (in via gate) but if you miss this and go straight on then take next left (west) there is a byway – this is really challenging – rutted slippery chalky clay – so go this way if you want a challenge. The little bridleway to get back on track is really tough! Challenge anyone to ride this section without dabbing. 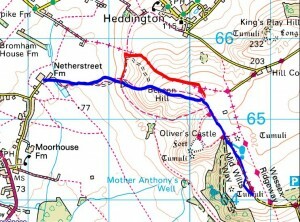 On map below, normal route is blue, challenge option in red. (We didn’t do the easier way – we saw it but as we missed the gate we did the red. Oops. Overall though, a really quiet and pretty route – but very challenging if rewarding. You can download the GPX route from the Download link under the map.